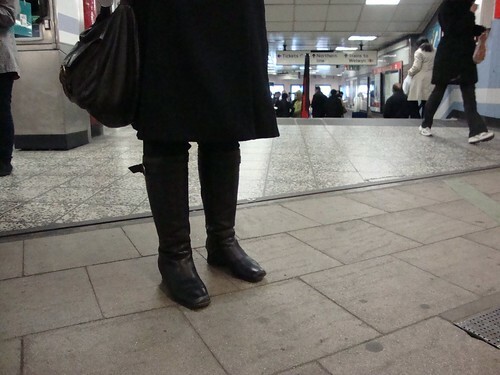 If you have a spare 20 minutes and want to listen to an interview with me about blogging and the Tube, pop over to Londonist or N Quentin Woolf's blog. He met up with me at Old Street London Underground last week, to find out where I get my inspiration from, what I think of other subway networks, my wishes for the Tube & a lot more. Thanks to N for interviewing me. There's a great collection of interviews with other Londoners in his Londonist Out Loud series. 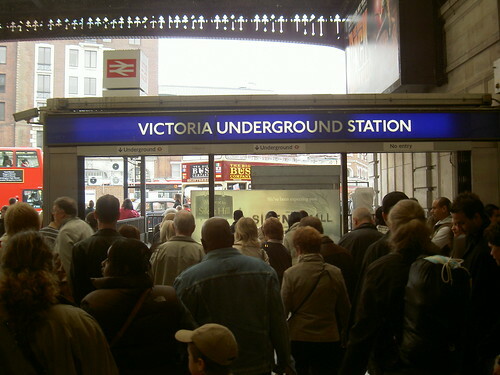 London Underground have asked commuters to stay away from Victoria station for evening peak time for the next 12 months. 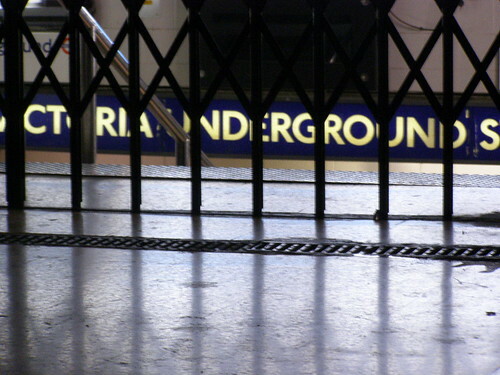 From this Monday 31st January, work will be begin on refurbishing the three escalators on the Victoria, Circle and District Lines, leading to restricted access to the station. People who use the station regularly will know that it's one of London's busiest stations (more than 220,000 people use it each day). It's already often closed due to congestion & overcowding. Fortunately, all three escalators will not be closed at once, but the closures will be staggered one at a time. However, as more passengers leave the station in the evening rush hour than enter, the remaining two escalators will only carry people up from the platforms to the concourse. If you want to use the Victoria line you'll have to enter via the District and Circle ticket gates and then go through a series of passages, stairs and smaller escalators - which the Evening Standard say could add more than 15 minutes to your journey. Just to add to all the extra movement, ticket offices will also be shut from 4pm to 8pm. Howard Collins, London Underground's chief operating officer, said: "The station is one of our busiest, with 80 million passengers a year expected to reach nearly 100 million a year by 2016. It is crucial we do this escalator work as part of modernising and enlarging the station." In leaflets at the station, TfL have advised people use other routes and avoid entering Victoria Tube station at evening peak times. If you want you're being prompted to walk or get the bus to Green Park or Pimlico stations. Circle line and District travellers should look at making journeys from St James's Park or Sloane Square. Good luck, now you'll know how people trying to change lines at Bank feel with year long escalator work there, also adding to a convoluted interchange. On Tuesday 1st February 2011, London Transport Museum are giving a talk by the extremely entertaining Robert Hulse, Director of The Brunel Museum. If you were unlucky enough to miss the sell-out walk through the Thames Tunnel last year, this might be the next best thing. Built between 1825 and 1843, and now part of the new London Overground line, the tunnel that links Rotherhithe to Wapping was originally designed for cargo. The Thames Tunnel is considered the crowning achievement of 19th century engineering pioneer Sir Marc Brunel and it is the first project of his son Isambard Kingdom Brunel and his father Sir Marc Brunel. Called the ‘Eighth Wonder of the World’, huge crowds flocked to see this engineering marvel of the age. It was the first tunnel in the world to be constructed under a navigable river using Brunel’s innovative tunnel shield. Huge crowds also flocked to walk through the tunnel last year as the tunnel hadn't been walked through by the public since 1865. Robert's talk will cover the tunnel’s whole history from its construction phases in early Victorian times, - when working conditions were lethal, to the modern day use of the tunnel as part of the reborn East London Railway. The talk starts at 6.30pm and tickets are £8.00 for adults; £6.00 for senior citizens; and students £4.00 for students. You can book tickets by calling 020 7565 7298. It's at the Cubic Theatre, London Transport Museum, Covent Garden Piazza, London WC2E 7BB. Update - Pete from The Londoneer went along to the talk and you can read his report of the night here. Kara Tointon from Strictly Come Dancing in her curlers and dressing gown at Charing Cross London Undeground station. The mind boggles. Basically some bright spark thought it would be a good idea to get the ex EastEnder to pose at the disused Jubilee Line platform at Charing Cross to promote BT's WiFi service & a new iPad App. She's pictured leaning casually against the roundel ready to use BT broadband at one of the 2 million free WiFi hotspots. As you probably know, last year a trial hotspot was introduced at Charing Cross station. Ianvisits who kindly sent me the picture doubts that WiFi is actually working on the disused platform anyway. Kara's actually no stranger to being pictured in weird situations on the London Underground. In 2007 when she was playing pregnant Dawn in EastEnders, her waters broke on the Tube. So it's good to see she's recovered nicely from the incident, although still not enough to realise that people normally wear more clothes on their Tube commute. Next week expect to see Kerry Katona posing at Aldwych disused station wearing fluffy slippers & pyjamas promoting an iPad app for Iceland. The 48 hour Docklands Light Railway strike set to start on the 20th January 2011, is now off following a High Court injunction preventing it. Earlier today, the BBC were reporting that talks to prevent the strike had broken down. David Stretch, managing director of Serco Docklands, had said: "It is extremely disappointing to find the RMT union totally refusing to work with us to avert the strike action they have planned for Thursday and Friday. The RMT are determined to disrupt services for our passengers, no matter what." However the legal action now means that the strike over redundancies, a new pension plan, work timings and the dismissal of two workers will no longer be taking place. Wait for a statement from RMT leader Bob Crow about the unfairness of the legal decision. Last June the High Court held that a Tube strike could take place, so it will be interesting to find out why the court thought this industrial action should be prevented. Thanks to everyone who entered the competition to win one of three Tube themed T shirts each worth £18 from We Admire. The response was great. We Admire were also pleased with your suggestions & said "There were some interesting, and amusing, ideas! It might be a while until we get round to acting on some of them though." I'll keep you posted, as you never know, one of your ideas may get made into a T Shirt. 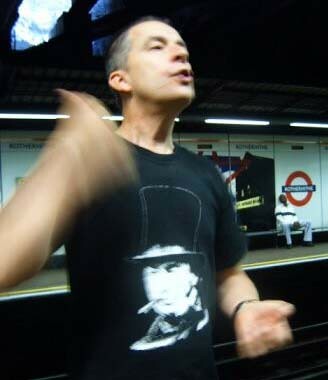 They will be able to choose from the Mind the Gap one (pictured above), a 1938 Stock T shirt or the Love / Hate Tube T shirt. Please contact me through my email address on the contact page & let me know, which T shirt you'd like - don't forget to let us know the colour background, size and your name & address. We Admire will send T Shirts overseas too. Thanks again for to We Admire for the prizes and keep an eye on their work through their We Admire's Twitter account as you may see they've made one your suggestions into a T shirt. 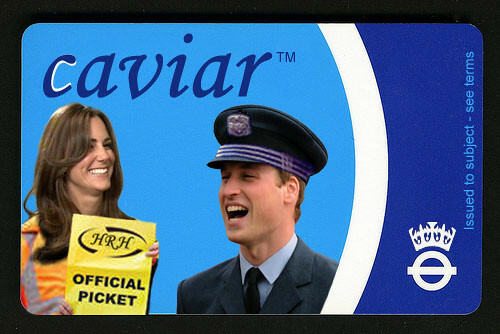 TfL just announced a multi-million pound partnership with MasterCard who will be exclusively branding Oyster card wallets in 2011. All new cards issued from Tube, rail stations & travel information centres will eventually come with the new branding. About six million wallets are expected to be distributed. MasterCard will also be branding London Underground ticket barriers which is all part of their strategy to raise awareness for their PayPass 'Tap & Go™' contactless payment system. Other cities already use a system where commuters pay travel fares directly at gates & barriers with the same credit, debit or prepaid card used to make everyday purchases. Boris's transport advisor Kulveer Ranger says of the branding partnership "The revenue generated will make a significant contribution to protecting frontline services and maintaining investment in the Tube upgrades and delivery of Crossrail." Great to get the extra cash, but I wonder how many people keep their original Oyster card wallet? I've not used a TfL wallet for years now. Tons of companies produce Oyster card holders as cheap promo items. 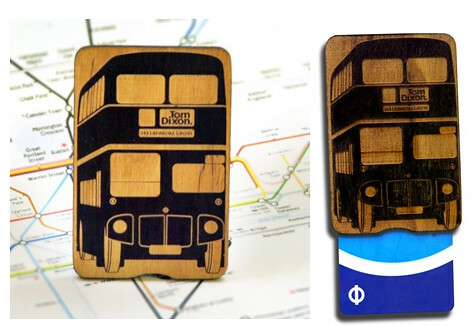 There's also loads of companies (including TfL and London Transport Museum themselves) who produce their own designs for the holders. 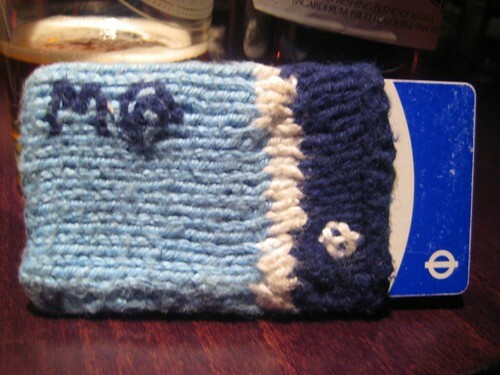 Do you have your own holder are are you a traditionalist, sticking to the blue Oyster card wallet TfL supplied? Do you even use a holder or just carry the card in your pocket, wallet or purse? Can our Tube commutes be brighter? Today sees the launch of SmileforLondon, a creative project that aims to brighten up the London Underground by showing a series of uplifting and inspiring silent films on digital platform screens across ten zone 1 stations. The project runs until 28th January 2011 on weekday mornings and evenings during the rush hour commute. You'll see them on certain platforms at Camden, Euston, Holborn, Liverpool Street, Oxford Circus, Moorgate, Victoria, Waterloo, Paddington and Piccadilly Circus Tube stations. Last week an urban planner, Alex Marshall, argued the case for a Conversation Car in the New York subway. He remembered the days when he used to strike up conversations with fellow commuters and hoped to revive "the dying art of conversation" as subway cars feel more like "monasteries than social spaces". As much as I'd like my commute to be brighter, I really doubt whether this idea would work in London or New York. Can you imagine actually seeking out a Conversation Car? It's a bunfight trying to get a seat on the Tube at the best of times. Even if you're lucky enough to get on the err.. supposedly "average" Tube train, with only 122 people on it, I wonder what sort of Londoners would relish the idea of conversation with random strangers? Or maybe not. Perhaps they'd start off by being those conversations you have with someone you're stuck in a lift with. Maybe it would be like having Twitter conversations. Perhaps eventually they'd turn into dating carriages. TfL might even be able to make an earner and sponsor the type of conversation per carriage, with "Conversation starters", getting us to talk about a particular subject. Chances are none of the above would happen. I reckon we'd be more likely to see the introduction of "quiet carriages" like the Quiet Zones on some railways. 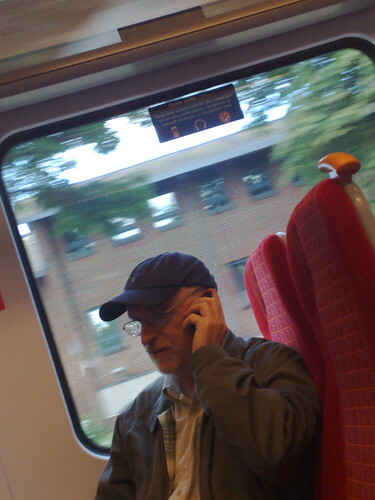 Funnily enough The New York Times reported that "The quiet cars have now become some of the noisiest, as passengers trying to read or sleep are constantly hushing and shushing others." Do you think "Conversation Cars" would work on the Tube? Do you think anything can really be done to brighten up your London Underground commute? Hat tip to Jemimah Knight for the Conversation Car link. How many people travel on the average London Underground train? If you're a regular commuter I bet you'd be thinking anything between 400 to 900 people. It's actually 122 people. That and more facts and figures that you can shake a stick at, are in a 290 page PDF document recently published by TfL - the annual Travel in London report. Incidentally the average number of people who travel on a bus is 17 which is up 22% since 2000, whereas passenger numbers on the average Tube only increased by 4%. Average numbers on the DLR are 79 up 18% from 2000. Overall, passenger journeys on the London Underground have increased by 10% going from 970 million in 2000 to 1100 million in 2009. Journeys on the DLR increased by 82% going from 38 million to 69 million in 2009, which reflects the development of the network with increased station numbers & train lengthening. 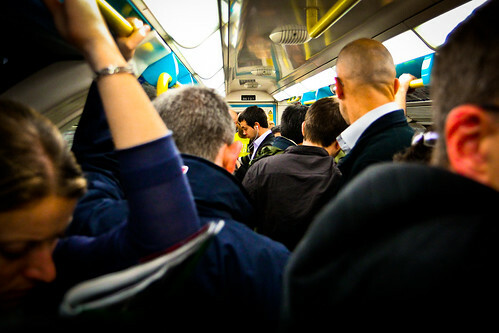 The Tube is still the main mode of transport for people getting into central London each weekday morning. From the graph below, it'll be interesting to see how much the green cycling section (or a mixture of cycling & Tube) grows over the years. "There were 13 per cent more person-kilometres travelled by Underground in 2009/10 compared with 2000/01, and 65% more person-kilometres travelled by bus. Between 2008/09 and 2009/10 there was an increase of 1% in bus person-kilometres travelled, and a 2% decrease in person-kilometres travelled by Underground." "In 2009/10 overall average journey time (scheduled journey time plus ‘excess’) averaged 44.1 minutes, a level only marginally higher than that of 2008/09 (43.9 minutes) and an improvement (ie reduction) of 0.4 minutes compared with 2007/08. Excess journey time is the average time added to journeys by delays, crowding and queuing, over and above the nominal scheduled journey time. Excess journey time in 2009/10 averaged 6.4 minutes, an improvement of 0.2 minutes compared to the previous year and of 1.4 minutes compared to 2007/08, and the best performance since the measure was introduced 10 years ago." If you've got a fair amount (ie loads) of time on your hands, you'll find a lot more graphs, charts and tables on all forms of public transport in London with spotlights on (surprise, surprise, for a report produced under Boris) "The Year of Cycling", the London Olympics and London's low emission zone. There's also figures on crime and saftety & journey experiences. 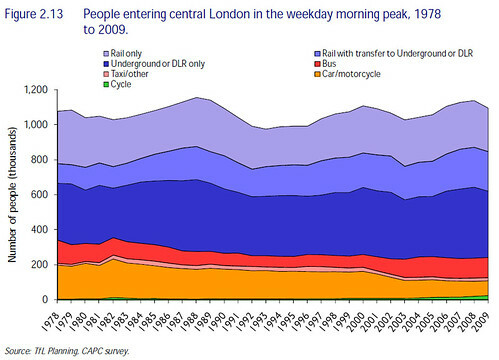 Psst TfL - some infographics might be nice for next year to break up the charts. 290 pages is a lot to plough through! To wish Happy Birthday to the London Underground, the lovely folks from Shoreditch based, T Shirt company, We Admire, are giving away three of their Tube themed T shirts each worth £18. 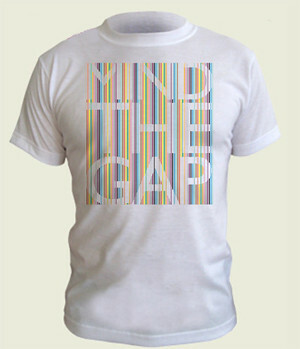 You can choose from the Mind the Gap one (pictured above), a 1938 Stock T shirt or the Love / Hate Tube T shirt. The three winners can choose from a range of background colours. All you need to do to enter, is tell us what you'd love to see on a London Underground T shirt. 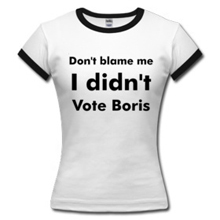 It can be a slogan, roundel, picture of your favourite Tube station, image of Bob Crow or whatever you like! We Admire can't promise to make the winning T shirts, but it will give them more inspiration for future designs. Keep an eye on their work through their We Admire's Twitter account. Good news is that you don't have to be based in the UK to enter. We Admire will kndly send the T shirt wherever you live in the world. We'll select three winners at random, but please make sure you leave a name in the comments so we know who you are. Anyone who shows up as Guest or Anon won't count. You have until 11.59pm UK time Sunday 16th January 2011 to enter and we'll announce the winners next week, so don't forget to come back to see if you've won! Have fun & good luck. Update - 19th January 2011 - News just in there's been a High Court injunction preventing the strike. 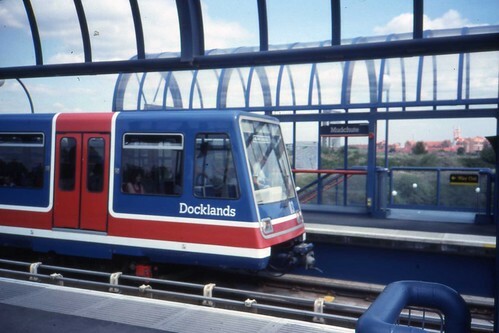 News just in that Docklands Light Railway workers have voted in favour of a strike over a series of rows including jobs, pensions and working conditions. This comes amid the row about Boris fighting strikes that don't exist, the fact that under Boris's "no strike deal" manifesto pledge there have been more Tube strikes than under Ken and another strike on the Bakerloo & Northern London Underground Lines this week. Of the DLR potential strike RMT leader Bob Crow, in full bullish mode, said: "Management at Serco Docklands continue to show total disregard for the idea of proper negotiation and consultation with this trade union on a number of issues and have also victimised and dismissed two of our colleagues. "Our members have shown in this massive vote for action (162 for and 36 against) that they will not be bullied and treated with contempt. The industrial relations situation at Serco Docklands cannot be tolerated any longer and our members have now voted overwhelmingly in favour of strike action and industrial action short of a strike. "This ballot shows management we mean business and that we will not accept their disgraceful attitude towards their staff, and it is now up to the company to respond positively to our demands for a solution that addresses all of the issues at the heart of this dispute." At time of writing there's nothing on the RMT's website about when the DLR strike might take place , although it does list the issues at the heart of the dispute. However, managing director of Serco Docklands, David Stretch hopes they might be able to avert strike action through talks and said: "We are extremely disappointed that the RMT is calling for strike action on the DLR. Constructive talks have already resolved a number of issues raised by the union and there are more meetings planned. "Our aim is to resolve the current issues before any action is taken which disrupts our passengers." 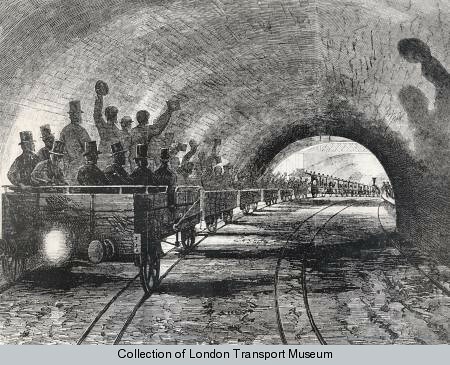 10th January 1863 - Passengers travelled on the Tube for the first time! Blimey, they didn't know what they were letting themselves in for. The world's first underground railway opened to the public on a Saturday at 6am from Paddington to Farringdon, making it the world's first Tube line - the Metropolitan Line. The Metropolitan Line had trains running every 10 minutes and carried 40,000 passengers between Paddington and Farringdon that day. "It appears that arrangements have been made for opening this line on the 10th [of January] for public traffic, but as the 1st of October, the 1st of November, the middle of December have been announced from time to time as the probable date of opening, it is presumed that no one will feel disappointed if a further postponement should take place. " From this excellent page on the Tube's opening. "Of the general comfort in travelling on the line there can be no question, and the novel introduction of gas into the carriages is calculated to dispel any unpleasant feeling which passengers, especially ladies, might entertain against riding for so long a distance through a tunnel. " Any gas that I experience being introduced while I'm in a tunnel is calculated to make me hold my nose and change carriages at the next stop. Interesting to see a union saying that a threat of a Tube strike is "remote". This is after a number of mainstream media (including BBC, Evening Standard & Sky News) reported that ASLEF were considering a strike on the day of the Royal Wedding. Even the Mayor gave an angry Tweet saying "Can't believe this. Surely not!" about the news linking to a Press Association piece. ASLEF's general secretary, Keith Norman, said today that industrial action on the London Underground had not even been discussed. Steve Grant, their London Officer said no ballot had been held and the union and the management were due to resume negotiations about compensation for all Bank Holiday working by London Underground tube drivers. ‘The story is premature to say the least,’ added Keith Norman. Looks like the press got a little over excited about the Boxing Day strike action over pay on public holidays, and thought, this would apply to the next Bank Holiday likely to get extremely bad press if a strike took place. Another year, another Tube strike announcement. Last year's dispute over staff dismissals continues as RMT members have just announced more London Underground strike action. Members of the RMT union on the Bakerloo Line & Morden depot of the Northern Line will walk out at 9pm Friday 14th January 2011 for 24 hours. When the action took place last year Bakerloo line services were suspended between Harrow and Wealdstone and Queens Park stations due to the Tube strike on Friday evening. On the Saturday there was only a partial service in operation south from Queens Park south to Elephant and Castle. However as with all strikes please check the Tube's website before you leave for the latest information. At time of writing there has been no statement from either TfL's or RMT leader, Bob Crow about this action. Update - 14th January 2011 - London Underground expect that disruption will be unlikely on the Northern Line, however significant disruption on the Bakerloo line is likely, though they intends to run as many trains as possible. Howard Collins, LU's COO said : "The union leadership failed in its attempt to gain support for the strike from Northern line staff. Less than 20 per cent of those balloted voted for strike action, and on the Bakerloo line only one in three of those balloted voted to strike. 'For the RMT leadership to try to disrupt Londoners in this way shows a disregard for Tube passengers and contempt for their own ballot process. 'We will once again seek to operate the best service possible. The last Northern line strike had no effect and we managed to keep a service running on parts of the Bakerloo line despite the action there. The RMT leadership should stop threatening Londoners with strike action and let our staff get on with their job of keeping the capital moving." Just as snow is forecast for London, it's time for the second No Pants Tube Ride or No Trousers on the Underground 2011. The No Pants Subway Ride has been running in the US since 2002, starting on the New York Subway by ImprovEverywhere. It's now taking place in over 40 cities throughout the world. 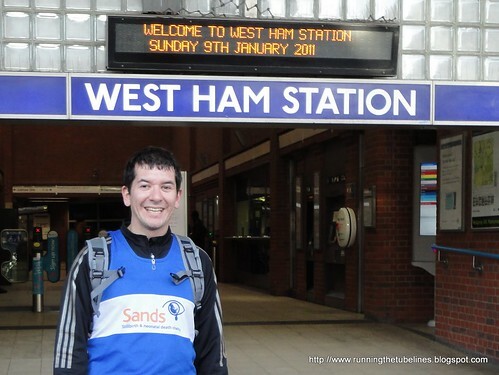 Rammi who took part in the event last year is organising this year's on the London Underground. Once again it looks likely to be a freezing cold weekend. However, on Sunday afternoon on the 9th January there'll be people casually travelling around the London Underground sans trousers. Last year over thirty people took part in London and there's currently over 170 signed up on the Facebook event page. There's still time to sign up, all you need is "Willingness to take trousers off on the Tube and the abilty to keep a straight face about it". The aim is to be nonchalant and like the US riders to look as though you've just forgotten to wear trousers. Rammi says: "You can wear fun underwear if you like, but nothing that screams out, 'I wore this because I'm doing a silly stunt.' Wear two pairs of underwear if it makes you feel more comfortable. Don't wear a thong or anything else that might offend people. Our aim is to make people laugh, not piss them off." Good luck to them, and I look forward to seeing any pictures or videos on Monday! Update - Over 100 people took part in the event. See what happened at No Trousers on the Tube 2011. I've never looked at the top ten blog posts before, but as the blog is coming into its ninth year (yikes) I thought it was about time to see which posts received the most views. Interestingly (& surprisingly) there were actually three archive posts from older years that made it into the top 10. Two on Max Roberts' great curvy Tube map - his original post from June 2007 and a post where he revisited the map in February 2008. The third was the distances between tube stations map post from October 2004. So taking those posts out, here are the most visited posts, written in 2010, in reverse order. The first (and sadly not only) appearance of posts about the Tube strike announcements in the top ten. This one's from 25th August. 7. Slides on the Tube - would you use them? Another fun one. Video of commuters on the subway in Berlin who were offered the choice of stairs, escalators or a giant slide to get down to the trains. Pictures from a stunt involving naked commuters travelling through Charing Cross station. The only Tube Map "mash up" in the top ten. Sam Loman charted the interchanges in our body to various "lines" on the map. One of my favourite posts of the year. 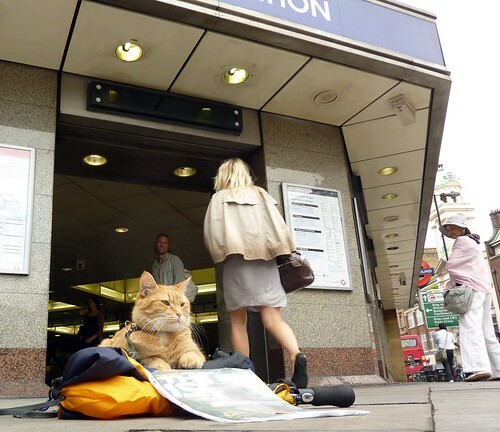 The lovely story of Bob the ginger cat who poses outside Angel Tube station with his Big Issue selling owner. 3. What's the best London Underground iPhone App? A review of five Tube apps for the Tube and people's thoughts on the apps in the comments. Another four legged friend on the London Underground. Super cute video of a dog who knows very little of the workings of an escalator. 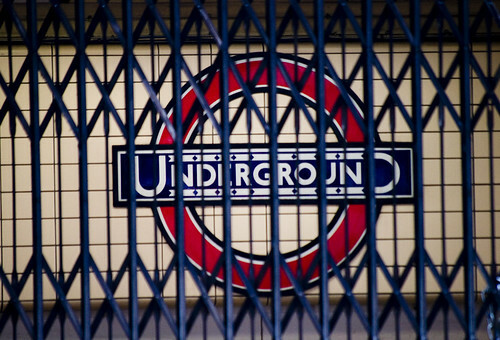 Sadly the most visited post of the year was a post on the Tube strikes. It's one that Google seem to really like if you're searching for "tube strike dates", which as you can imagine a shed load of people did in 2010. That's it. Thanks to all the comments, tweets, follows & ReTweets over the year. Thanks to everyone who keeps visiting the blog. And a special thanks to all those who send me fun (and not so fun) London Underground stories, pictures and videos. Please keep them coming. It clearly wouldn't be the same without you!